The File Cabinet was nominated for an Edublog Award this year. I am honored! Shelfari: What am I reading? I have struggled in the past months with where to take the direction of my blog. I want to write. I want to share. I decided at the start of the year to start fresh with “In the Trenches,” a new blog focused on resource sharing. For this time in my life, I’m finding it helpful and inspiring to maintain my writing there. I don’t want to shut this one down, but I just wanted everyone to know where I was. Thanks for checking in with me! Please head over to “In the Trenches” and check me out there. I’d love to continue to learn with you! Today my colleague and PLN member, Kevin Jarrett, shared this infographic. It was too good not to share. 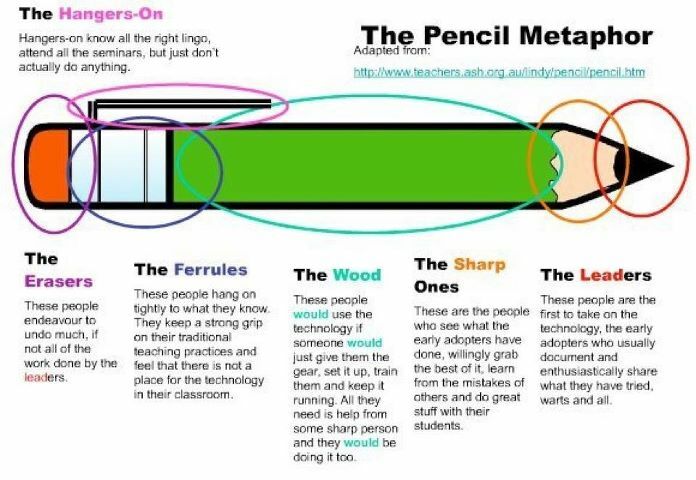 This particular metaphor references the willingness of individuals to embrace technology in the classroom, which makes the idea of the pencil even more ironic. Yet, the more I read each of the descriptions, the more I was able to picture individuals and groups of people that I’ve encountered who fit these characteristics. Very few of the situations that I can think of have anything to do with technology. I identify with this metaphor so much because of how it is applicable to any kind of change. It reminds me of the PBS behavior support triangle. 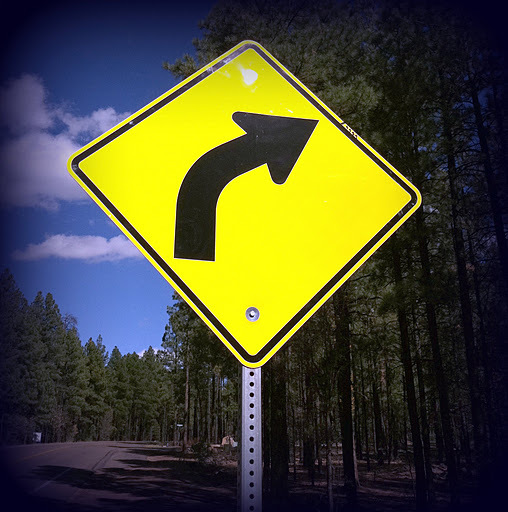 In most cases, 80% of people are willing to go along with changes and roll with them. 15% will resist them, but they will comply – just not always with the best attitude or consistency. The remaining 5% are those who use every fiber of their being to resist changes. What astounds me when reviewing both of these is how loud of a voice the erasers and “red zone” seem to have. They don’t just seek to resist changes in their own lives, but they seek to undo the work that others around them are doing. What could possibly motivate this behavior? I really don’t know. I am constantly in awe of those who so vehemently act in this manner. The effort that they place into resisting any changes in their lives and blocking those who stand behind the changes could be redirected positively with only a fraction of the spent energy. The erasers in this scenario are not like those in my classroom, who seem to wear down in a day. Where do schools (and any other facet of life) go from here? Will there be a point where the anti-change agents voices are overshadowed by those working to move our schools forward? We have to hope so. That’s the only thing that keeps the pencils lead sharpened. The North Carolina Museum of Life and Sciences in Durham is hosting Teacher Appreciation Day on Saturday, August 27. We will be offering free admission for public and private K-12 teachers (with school ID) and one guest. Come see the Museum through the eyes of your students! Climb inside StarLab, our portable planetarium, to learn about the constellations; marvel at the sight (and taste!) of our unbeatable liquid nitrogen ice cream; learn about the many programs the Museum has to offer for your grade level through a sampling of the materials and activities we use in our focused field trips; meet the staff who facilitate our educational programs; and let us thank you for all the hard work you do! Do you need to have a conference call but aren’t sure of a good route to take? Do your colleagues and friends have a hard time making it onto a web-based conference call, like Skype? Do you struggle with reliable internet, right at the time when you were scheduled for an online meet-up? Rondee is a free conference call solution that allows participants to join in a pre-set conference while online or from a standard cell phone or home phone. This is a great option for those of us who are constantly on the go. I was even able to participate in the NC DEN LC meeting the other evening from the sidelines of my son’s football practice because I could just call in! This is an excellent option when your colleagues are limited by accessibility, travel or other barriers to making it in front of a computer for a set time. Are you a fan of Peter H. Reynolds? If you aren’t sure who he is or about the great things that he and FableVision do for kids and learning, stop reading this right now and go visit his webpage. Seriously. Go! If you are back, or just still here, then you know that Peter H. Reynolds and Fable Vision are responsible for some amazing kids’ literature that focuses on finding their own creativity, their own stars. He is also an advocate for educators and offers us wonderful resources, like his free, downloadable posters. One of my favorite books of Reynolds’ is The Dot, which has become so beloved around the world that it has become its own day! Help your students find their own mark by celebrating International Dot Day on September 15, 2011. Read The Dot together as a class and find ways to have students make their own marks. Need some ideas for inspiration and activities? Check out Reynolds’ page for The Dot at his website. Start planning now! Be prepared to share your mark with other educators in September! First of all, I’d like to say how disappointed I was to see that the last posting date I have for my blog is December 1. In my defense, I’ve been facing the trials of being in the early months of pregnancy. I’m happy to say that we will be adding to our family of four in mid July, but that hasn’t been good for the blog! Despite how long it’s been since I’ve posted to Keeping Kids First, I’m so happy to be sharing this post. 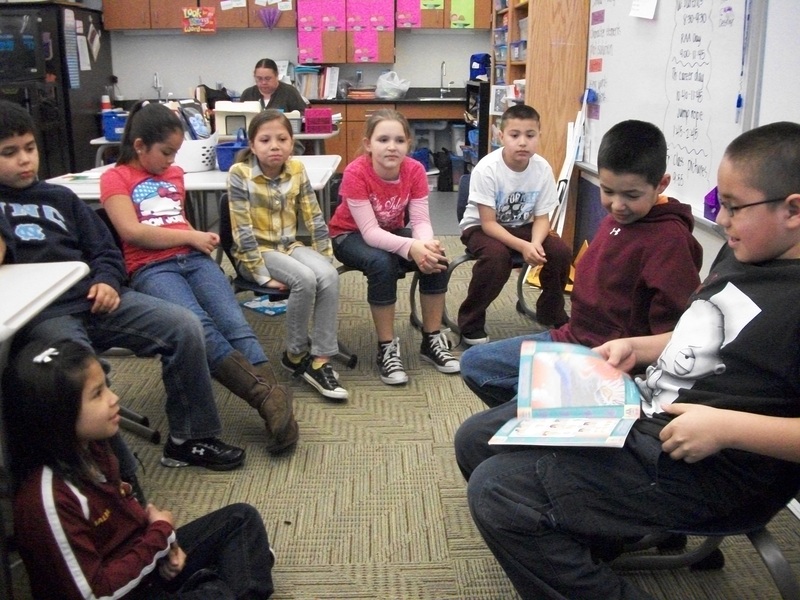 Each year in the USA on March 2, we celebrate the birthday of Dr. Seuss with Read Across America Day. 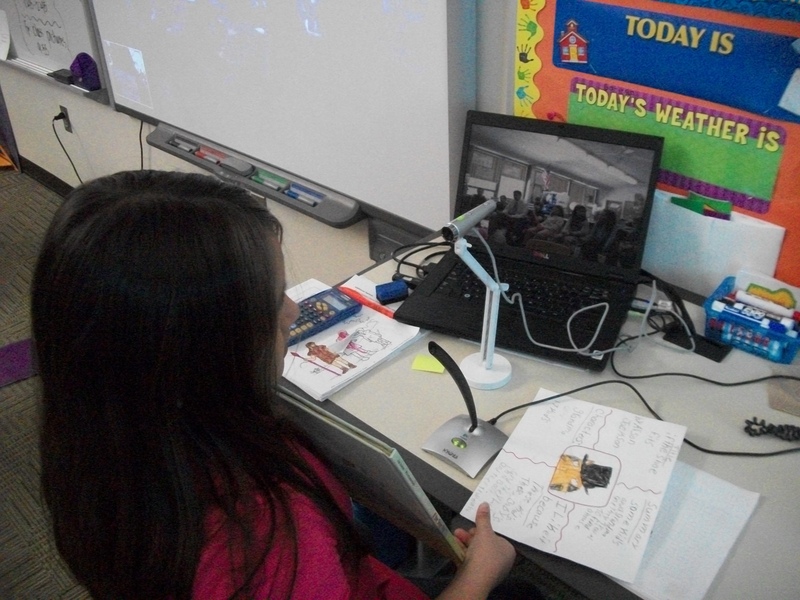 This year, I decided it would be a great experience for my students to actually “read across America” using Skype to foster cross-classroom collaboration. A few weeks ago, I was overwhelmed by the response by my Twitter and Facebook PLNs when I went looking for classrooms who might be interested in sharing this day with us. I scheduled us classrooms to chat with all morning in thirty minute intervals. I also helped my students to prepare for their conversations with writing book talks, practicing read-alouds and honing our skills on being respectful listeners. As March 2 approached, I was excited to have parents join us for our classroom “Read In” first thing in the morning, which was also kicked off with our first call of the day. The parents of the students who attended, as well as other staff members who happened to stop by during the morning, were awed by how we were able to collaborate and share with classrooms across the country, how engaged the students were, and their enthusiasm for the opportunity. We charted our “visits” with Google Maps, which was also a great experience for students to see how far they were reaching! Over the course of the day, we shared favorite books with Dan Callahan and Sarah Hayes’ class in Burlington, MA. 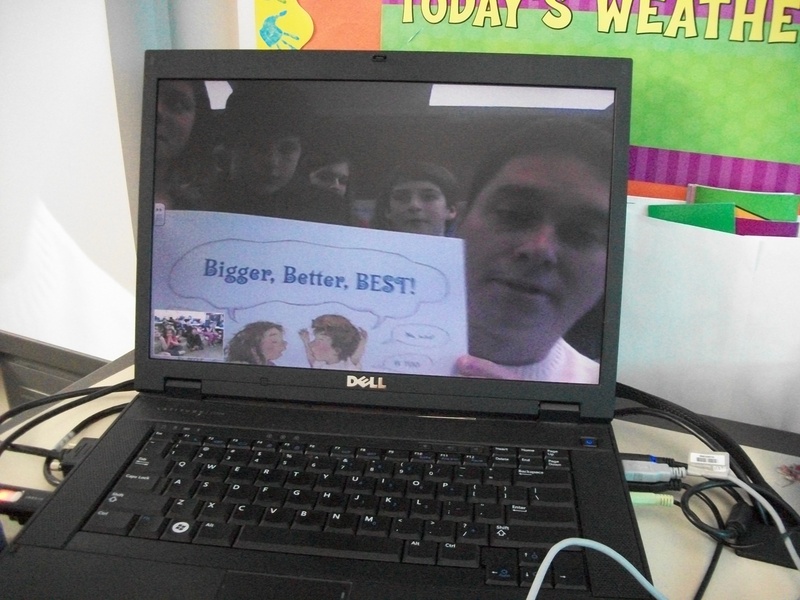 Eric Biederbeck’s 6th grade class in Essex, Vermont read us a favorite picture book, Bigger, Better, Best, that tied into our current study of Geometry. We read a favorite Cherokee cultural story, The First Strawberries, to a third grade class in Verona, New Jersey. A high school class in Sterling, Kansas, led by Carol Prather and Dean Mantz, even read a few of their favorite books to us. What a great way to share and grow a love of reading! Are you looking for a creative and practical gift that you can share with everyone on your school’ s staff? How about one that is totally free? Check out this great Advent Calendar of Web 2.0 Resources created by Kelly Tenkely of iLearn Technology. Remember, you just get to open one per day!